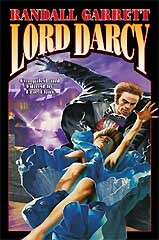 Randall Garrett's Lord Darcy is, without doubt, one of the best known and most popular detectives in science fiction and fantasy. His stories are set in an alternate universe where magic works and the Plantagenet dynasty of England never fell. (Yes, that's Richard the Lion-Hearted and the rest of the crew—say what else you will about them, the Plantagenets were the most colorful dynasty in English history.) This volume marks the first time that all eleven stories, including the full-length novel Too Many Magicians, have been collected between the covers of a single book. With the exception of "The Spell of War," which we've placed as an appendix, all the stories are arranged in chronological order. An interesting facet of this series is that the date in the story corresponds closely to the year it was written. Garret wanted to give you the feel that this was taking place now—as our world would be with two "minor" changes. The stories contained in Part I, concluding with the novel Too Many Magicians, all take place within a relatively brief period of about three years. From there, we leap forward several years. Part II contains three stories beginning in 1972 and ending two or three years later. The three stories in Part III take place shortly thereafter. We have placed them in their own section because they are closely connected. "The Napoli Express" is a direct sequel to "The Sixteen Keys," the basis for which, in turn, is set in "The Ipswich Phial." Finally, we placed "The Spell of War" as the conclusion to the volume, even though in terms of internal chronology it is by far the earliest of the tales. The reason we did so is because this story is atypical. It is a war story, not a detective story. It was the last Darcy story which Garrett wrote, late in his career. It tells the tale of how Darcy first met Sean O Lochlainn—not, as they would become a quarter of a century later, as Chief Investigator and Master Sorcerer, but as a very young lieutenant and a young sergeant, fighting together with guns and magic in the trenches of the War of '39. P.S. Those of you who are also fans of the mystery genre—as Garrett was himself—will enjoy spotting the many clever allusions he tucked into the stories referring to famous detectives of fiction. Some of them, such as Rex Stout's Nero Wolfe, Archie Goodwin, and even the Pink Panther, are obvious enough. But our personal favorite is in danger of being lost in time. Not many will remember the once-popular 1960s TV show The Man From U.N.C.L.E. The pun, it is often said, is the lowest form of humor (which, needless to say, never stopped us from laughing at Garrett's superb display of the art). See if you can spot it three ways in his novel Too Many Magicians.